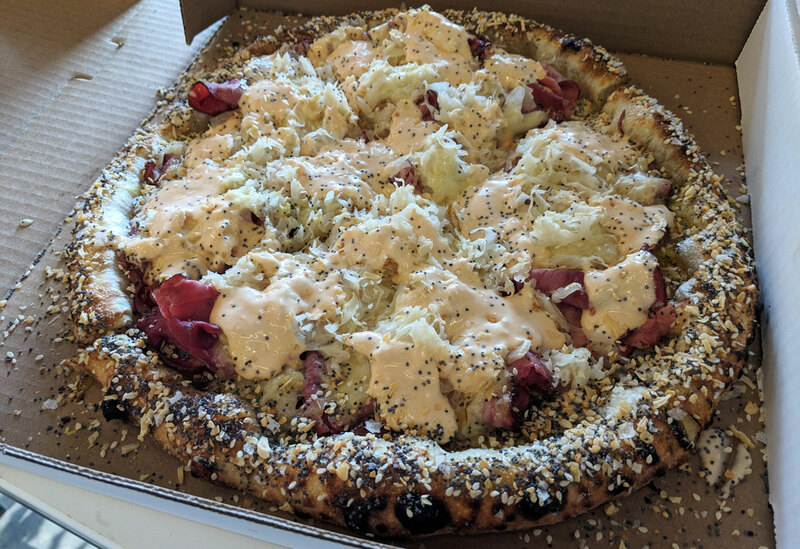 A Reuben pizza is one of those things that’s simultaneously ridiculous and oddly compelling. It probably shouldn’t work, and yet… as soon as I saw it, I knew I had to eat it. It sounds absurd (and amazing). It looks absurd (and amazing). Alas, it’s just absurd — it’s not particularly amazing. 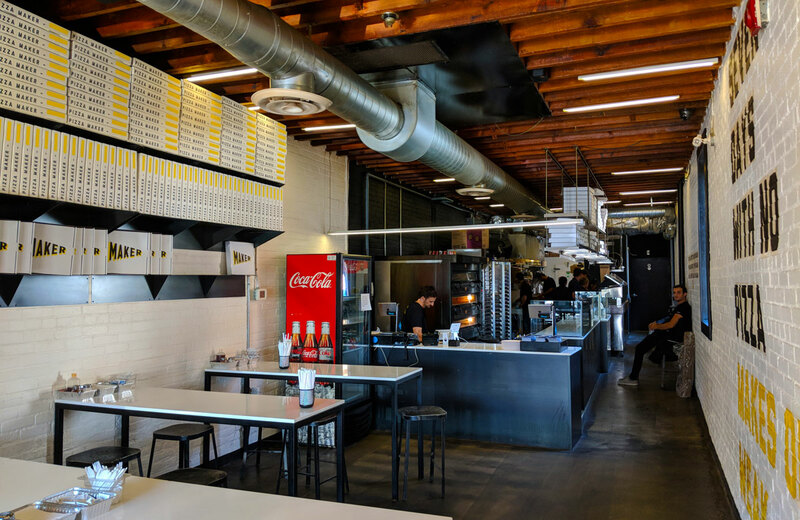 I will say that the (non-absurd) pizza at Maker is some of the best in the city. Even in this particular pie, that’s fairly apparent; the crust is outstanding. It has an amazing flavour, a good amount of char, and an absolutely irresistible crispy/chewy/bready texture. I was afraid that the everything bagel elements would overwhelm the crust, but they actually work quite well. The crust also manages to not completely collapse under the deluge of meat, sauerkraut, cheese, and sauce, and it manages to do that without feeling overly substantial. That’s no small feat; certainly, it’s a testament to how good the crust is here. 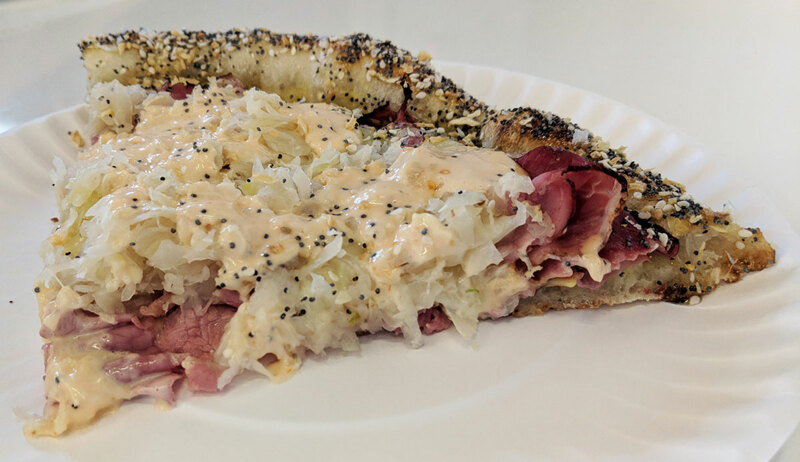 And while the Reuben elements are all tasty (the thinly-sliced smoked meat is a little bit tough, but the Reuben flavours are otherwise perfect: it’s meaty, cheesy, salty, sweet, and vinegary, with everything balanced really well), it never quite coheres as a pizza. It just feels like too much stuff. It needed more bread to balance out the voluminous ingredients, like… oh, I don’t know, a sandwich?? It probably would have worked better as a calzone, but then that wouldn’t have been nearly as Instagrammable, which I imagine is half of the point of this thing. And that’s the problem — even though all of the elements are really good, it’s a food mashup that never should have been mashed up. It’s a gimmick. I would have rather eaten a Reuben sandwich or a regular pizza. This takes two great things and makes both of them less great by combining them.